I really don't know why I tried this. Today, while on a particularly boring conference call, I searched on iTunes using the keyword "cichlid" . 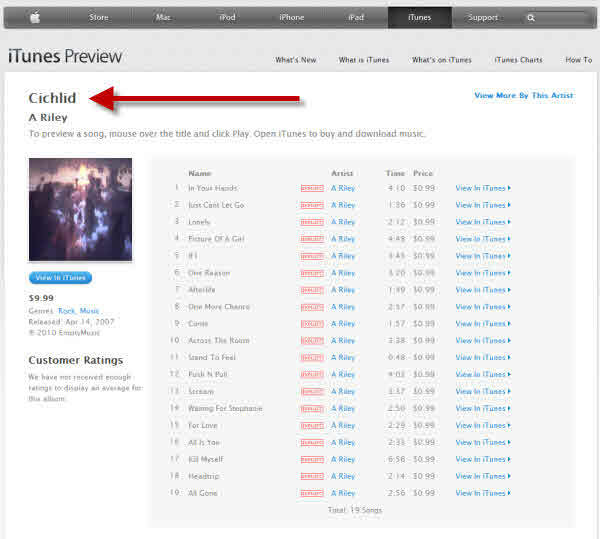 Wouldn't you know it, there is an album called Cichlid by the artist A Riley! I only previewed one of the songs (they're all marked explicit) and its not really my taste. There is one song called "Kill Myself" which I sometimes feel like doing when I can't get my fish to breed, but that's a story for another day. Check out this link if you want to hear it for yourself. If you've kept fish, no doubt you've also dealt with sick fish. If you have a fishroom full of healthy fish, you need to be careful when bringing in fish from the outside, from pet shops, swap meets and auctions. While quarantining is essential, you also need to be mindful that you don't inadvertently transfer disease from tank to tank when netting fish or changing water. A few years ago, I visited my good friend Chuck Rambo in San Jose, CA. Chuck took me a large wholesaler in the Bay Area. We first checked out a cart which included a net and a small container of Net Soak. Before using the net in a new tank, you had to dip the net in the Net Soak and shake it out. Net Soak is usually a solution of Potassium permangenate which is an oxidizer. It helps to prevent the transfer of disease organisms by oxidation. Unlike other oxidizers such as bleach, it is gentle on nets and your hands, and pretty safe to use. Net Soak prevents most bacteria from spreading, but not viruses. 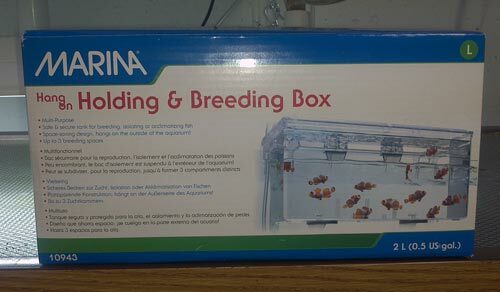 Fellow GCCA Member Jason let me know about the Marina Hang-on Holding and Breeding Box, raving about how useful this piece of equipment is for raising baby fish. In fact, Jason wanted me to test them out so he gave me one. I later acquired another one at the GCCA Holiday Party gift exchange, so I thought it was probably about time I checked it out. The Marina Box is very much like an air-driven power filter that hangs on the outside of your tank. The construction is good and the material is very clear plastic measuring 9.5 W X 3.5W X 5 deep. I tested the Large size box. On Amazon, this product is about $21. Smaller version are in the $14 range. I believe some wholesales offer them for less. The product comes with a divider so you can separate some fry or perhaps a smaller adult fish on each side. One nice feature is the offsets on the bottom which allow you to easily adjust the offset of the unit from the tank so that it hangs perpindicular to the side of the tank.